The scientific term for wisdom teeth extraction is “odontectomy” which is a dental procedure that involves the surgical removal of an impacted tooth. Wisdom teeth extractions involve the incision of gum tissue, the reduction of bone, and the sectioning of the tooth into smaller fragments. This dental procedure is performed under local or general anesthesia, and may be carried out by a general dentist or an oral surgeon. 1. Not all wisdom teeth have to be surgically removed. This is because not all wisdom teeth are impacted. Our wisdom teeth erupt last into the mouth usually between the ages of 17 to 21 years old. During this time all of our permanent teeth have already erupted so there will be no more space for the third molars of wisdom teeth to occupy, making them become impacted. However, when the wisdom teeth erupt normally, they will not at all require wisdom teeth extraction. 2. There are 3 different classifications of tooth impaction. An impacted third molar or wisdom teeth may be classified according to the position it takes in the mouth. 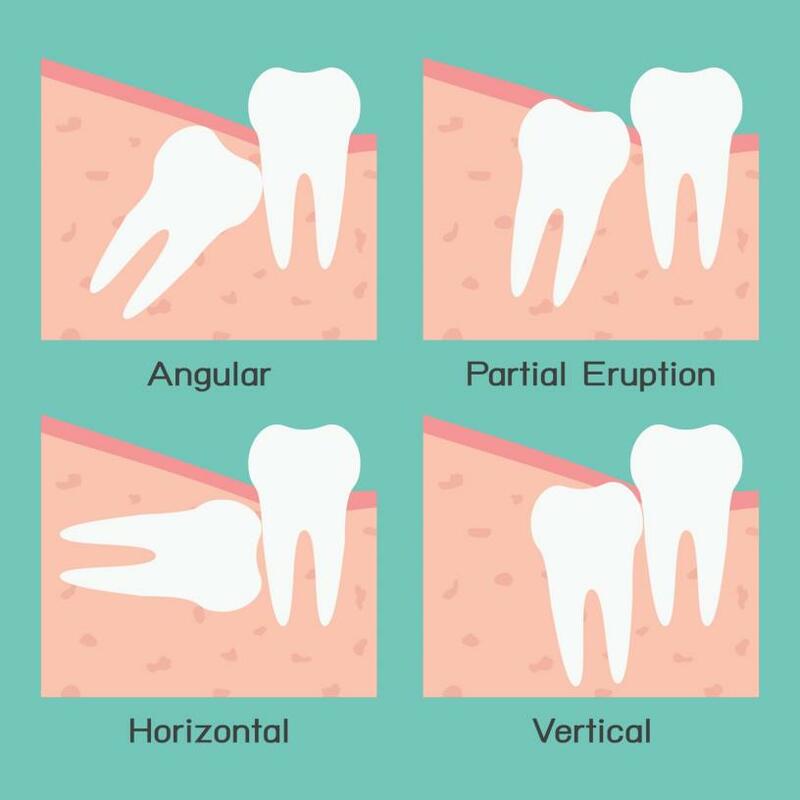 First, the wisdom tooth is vertical when it assumes a position that is parallel to the adjacent second molar, horizontal when it assumes a position that is perpendicular to the long axis of the erupted second molar, mesioangular when it is diagonally tipped towards the second molar and distoangular when it is diagonally tipped away from the second molar. Another classification is made according to its depth within the bone: whether it is as the level of the occlusal plane of the second molar, set below the level of the second molar’s occlusal plane, or found below the level of the second molar’s neck. Finally, they can be classified according to coverage: either it is full exposed; partially covered by gum, bone or both; or fully covered by gum, bone or both. 3. Are wisdom teeth extraction procedures painful? Wisdom teeth extractions usually proceed comfortably and painlessly for most patients. An anesthetic solution is applied before the procedure is begun so the area is numb. Any pain and discomfort during the procedure will depend on the following things: presence of dental infection that may neutralize the effect of the anesthesia, proximity to nerves, low pain threshold of patient and so many others. When the case is ideal, the extraction should proceed positively. 4. Is it ideal to have all four impacted molars to be able taken out at once? the capacity of the dentist to perform the multiple extraction. Wisdom teeth extraction procedure are planned this way because recovery after surgery is not easy, in fact recovery can be more uncomfortable than the surgery itself. So by having the extraction done in one session, the patient is limited to go through one recovery period instead of two, three or four. Need more information about wisdom teeth extractions? Call our office today.